Pullum Purna (プルム・プルナ, Purumu Puruna?, based on برم برنا) is the daughter of an Arabian multimillionaire. She decides to travel the world with her bodyguard Darun when she overhears her grandfather's concerns over "Shadaloo", believing that it is the name of a person. 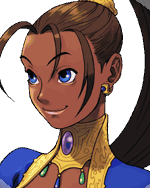 Unknown to Pullum, the reason why her grandfather was worried about Shadaloo was because she has a blood relative working for the organization who was a candidate in becoming a Shadaloo executive. She later inherits a kingdom after the death of a relative and decides to travel the world once again with her bodyguard Darun to search for her missing father. This page was last edited on 28 September 2009, at 22:35.